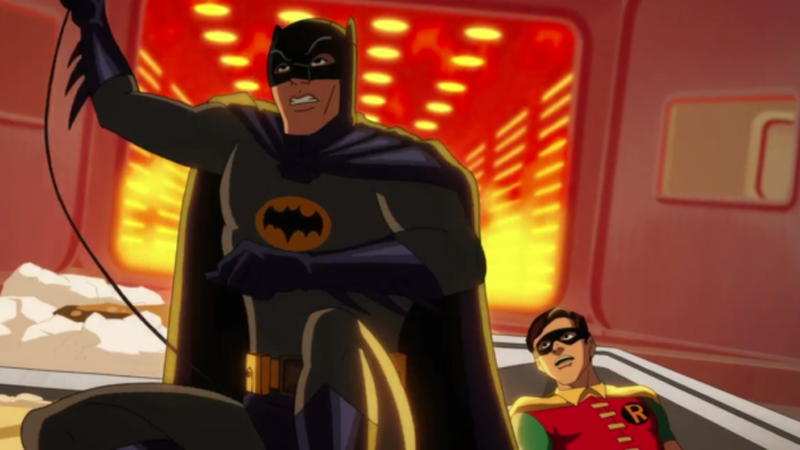 It’s been over a year since Adam West revealed that he and Burt Ward would reprise their roles as Batman and Robin for a new animated feature—but now we have the first look at it in action: Holy footage, Batman, it’s a trailer for Batman: Return of the Caped Crusaders! Featuring the vocal talents of Adam West, Burt Ward, and Julie Newmar, Return of the Caped Crusaders is coming out in just a few months—but really, you should watch the first trailer, released through Entertainment Weekly today, in which Batman explains to Robin the premise of their own movie while escaping being trapped on a giant TV dinner tray. I’m already in love. According to, err, Batman, the movie will see the dynamic duo face off against the Joker, the Riddler, Penguin, and Catwoman (with presumably new actors stepping in to replace the dearly departed Cesar Romero, Frank Gorshin, and Burgess Meredith) on Earth and in space. If this trailer is any indication, this whole goddamn movie is going to be a total delight. Batman: Return of the Caped Crusaders will be available digitally on October 11th, and on Blu-Ray November 1st.